Feeling more fatigued than focused? This energising duo lives up to its name by awakening the senses and providing a significant, uplifting boost. Featuring two of Therapie’s most invigorating hero products with a 25% saving – Energy Lift Rollerball and Boost Hair & Body Wash – this dynamic duo will help to restore energy levels, keeping you cool, calm and on the ball. 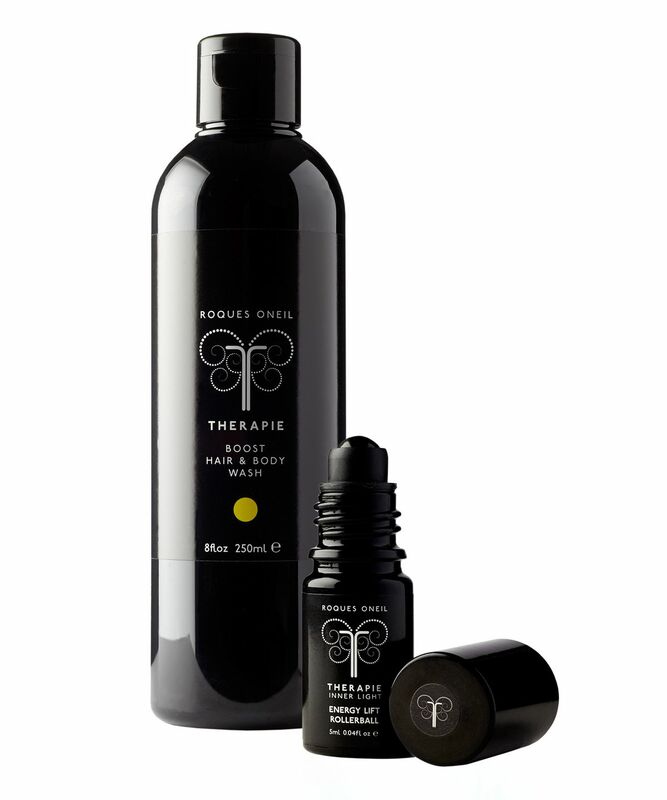 If you’re feeling flat and need a little perking up, Therapie’s Energy Duo could be just what the doctor ordered. First on the uplifting agenda, Boost Hair & Body Wash cleanses skin and hair but also contains an invigorating concoction of soothing organic aloe and refreshing, clarifying oils of spearmint, rosemary, basil, geranium, grapefruit and fragonia. Helping to stimulate circulation and open your airways, this super-natural concoction gives an extraordinary boost of energy and alleviates stress, leaving you ready for anything. Therapie’s Energy Lift Rollerball is a revitalising magic potion that helps you to maintain mental focus and concentrate on tackling the task in hand (whatever that may be…) It stars a blend of sweet basil and lemon to combat fatigue, plus fig, wild rose and silver fir to inspire inner strength, relieve deep-seated tension and help dispel emotional distress. Just apply to pulse points and inhale when you feel uninspired. Instant: rub the essence onto the palms of your hands, cover your nose and inhale deeply 3-4 times. Anoint: apply to the nape of your neck, crown of your head and the soles of your feet (if accessible) – then apply to your hands and inhale deeply 3-4 times. This ritual is part of the ‘mindfulness’ process. Squeeze a grape-sized amount into the palm of your hand and wash your body while inhaling and exhaling deeply, so the aromatherapy essences have the chance to permeate your airways. For maximum benefit, apply using long strokes along the energy pathways; these run along the body, top to bottom along the arms, legs and torso. Repeat three times back and forth over each location to supercharge your day, increase circulation and boost clarity. It's no secret that I love this brand and use it as a daily support mechanism. Lack of energy is one of the biggest complaints in modern life. If you don't drink alcohol, sleep 8 hours a night in an oxygen chamber, exercise in pollution-free air, eat a perfectly balanced veggie diet and work in a stress-free environment you will solve this. If you don't, I recommend this duo. It's a morning boost for your shower and a handy, gorgeously scented quick fix when you start to flag during the day.